This intensive is an inward journey into the psychology of the chakra system, through theory, self-study and practical application. This 300-Hour Yoga Teacher Training takes you on a personal journey through the unseen chakra system to transform and deepen your knowledge of the philosophical world of yoga. This course emphasizes more on the subtle bodies than the advancing of asana poses because truth be told, anyone can learn to perform asana poses through flexibility and strength training. The spiritual, physical and theory behind yoga take a lifetime to master. The teachings are a combination of theory and practical exercises, which are designed to assist your understanding with the physiological and psychological connection of the mind, body, and spirit connection. These personal tools can help build a healthy, respectful, and loving relationship with yourself and the world as well as serve as a teacher who inspires your students. Your beliefs, conditioning and programming are like the hard wiring of a computer. Within each of us, we have our own personal software. In each of the chakra centers is where our program is written. For most people, there is little to no awareness of these limited programs, unless they take time out of society and invest into self-reflection into the subconscious of these beliefs and programs. Your personal program is formed in your upbringing, culture, and experiences. Some aspects of your programs held within you might like and other aspects you may desire to alter. At our 300-Hour Yoga Teacher Training you will learn to explore the depths of these programs. We are not here to provide you with the answers to what is “right” or “wrong”, but only to help give you the tools needed to go on an effective journey of self-discovery. Once you learn to serve yourself then you can truly begin to mentor others on their journey of growth through the practice of yoga. In a combination of theory and practical application, we study one major chakra every three days, reflected each specific element, asana, pranayama, kriyas, mudras, sound, mantras and meditation that influences the conscious awareness associated with each specific chakra. In this subtle realm of existence, there is a lot of unexplored territory for even the most experienced yogic scholar. When we delve into these topics we discover which chakras contain blocked energy and suppressed emotions along with learning techniques to find balance and peace. We invite our shadow side to be revealed, healed and transformed. It is in the deeper programming of our subconscious of the inner psychological mind. The content and depth of this training require a sense of personal responsibility and a willingness to be vulnerable and open for change. When we are ready and give ourselves permission to become vulnerable and look at the freedom of self-transformation, limited programs and release stuck emotions, it is in the depth of this space where transformation happens and consciousness awakens. The process of transformation is not always comfortable, yet we provide a sacred and supportive space for transformation to occur. If you are ready to make a change and learn tools for self-transformation, healing, empowerment and want to understand the subtle bodies then this training is for you. Redefine your alignment and understand the benefits through a study of the 5 various poses, standing, seated, twists, inversions and backbends. Teaching practice to a group and one to one. Assessments There will be various assessments given through out the course to confirm your understanding the theory of the chakras. Final Practicum is a choice of teaching a 2-hour asana class including meditation, mantras, and pranayama or a 2-hour workshop on the chakras. Facilitate an asana class connected with a chakra or meridian theme. How to read subtle energy of the group and teach from what is needed. The 3 grunties- the inner locks within the bodies. Understand how the endocrine system is connected to each chakra. The functioning of the endocrine system. Practical exercises to transform energy blocks. We give precedence to the practice of Pranayama in this course. During the two weeks of the course, we have two, one-hour pranayama classes per day. Introduction to seven various pranayama practices and some not so commonly practiced pranayama techniques. These kriyas are powerful ways to connect and move and redirect inner prana. These practices are subtle awareness of consciousness which move through our bodies and the chakra system. Preliminary practices are important, so these teachings will be shared accordingly based upon the experience and background of the students. Daily meditation practices are offered throughout the course, which vary in duration of time from 30 – 60 minutes. Includes chakra meditations, breath and sound meditation. The practice of rotating conscious awareness throughout the body to relax the mind and body while reprogramming beliefs held in your subconscious. Yantra Yoga, discover the frequency you hold in your life’s number with numerology. Preserving energy through Mouna (silence). All our breakfasts will be in silence and there will be selected days where all will be in silence aside from the teachers sharing in lectures. This encourages a preservation of energy and consciousness. 6:30 – 10:00 Morning Sadhana Includes: Meditation, Pranayama, Mantras, Kriyas and Asana. Sequoia has been teaching for over a decade and studying yoga and spiritual practices for over 20 years. She embodies the yoga teachings and this shines through when she teaches. Her passions are pranayama, mantras, yoga nidra, meditation, philosophy and nada yoga. Gosia Orlicz started to practice yoga in 2004 and explored many different styles. Practice on the mat is just a small part of her way of understanding yoga. Gosia works as a yoga teacher and yoga therapist, pharmacist, health coach and ayurvedic health consultant in Switzerland and in Bali. Music has been Shir’s main passion and occupation since childhood, playing the recorder and violin. Now, he shares his love of music and the divine consciousness through leading Kirtan sessions (chanting mantras).Shir is inspired by the healing power of magical sounds and uses this inspiration regularly in his teachings. Who is this 300 hour Yoga Teacher Training for? This course is designed for those who wish to go inwards through the understanding of the subtle bodies. Are you are ready to get in touch with your emotions and look deep within? Do you have the courage to allow yourself to become vulnerable? You either hold a 200-hour YTT certification or have an equivalent in a personal Sadhana. If you have a personal Sadhana you will not be able to register as a 500-hour yoga teacher with Yoga Alliance, but if you complete the course you will receive a certification from our school. Personal Sadhana means you have a regular practice. This practice may include any aspects of Yoga, asana, mantra, pranayama, meditation, jnana ect. You are able to hold sacred space for others. My prana was accessible, but I lacked the tools to understand it. Sequoia provided the parameters, gave me the perspective. It’s been almost four years since then and the benefits continue to surface. Life presents precious few opportunities to study with un-corrupted masters. I am forever grateful to have met Sequoia. She has such incredible knowledge, teachings, and energy. Sequoia was one of my teachers on a one month yoga teacher training course in India, and from the very first pranayama class we had with her, I felt I had encountered a very unique and powerful teacher. 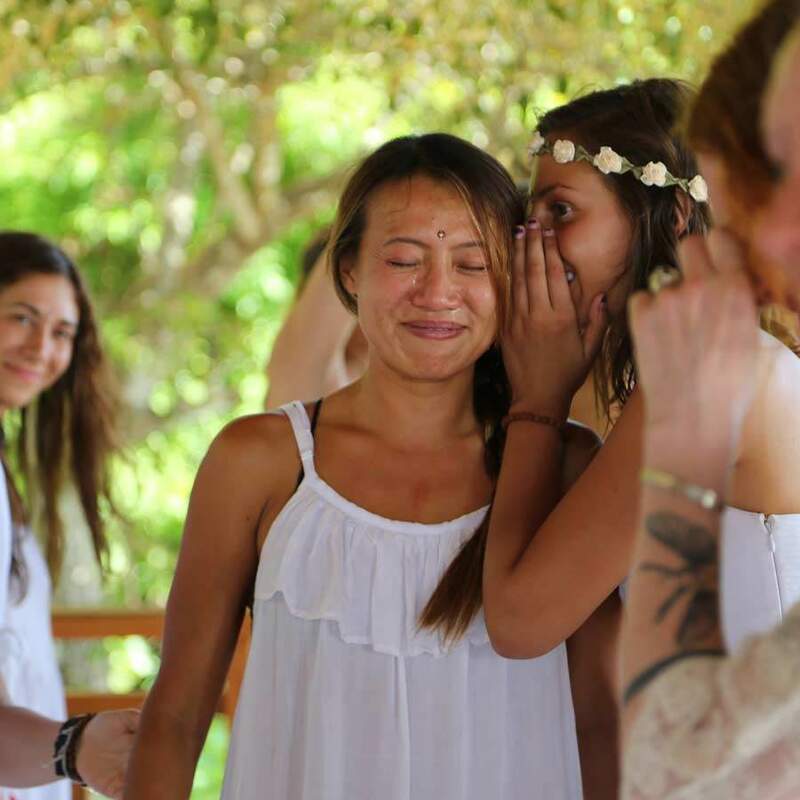 During my time in India I was lucky to experience Sequoia’s yoga classes, sound healings, and ceremonies. Her understanding and insight into yoga and spiritual exploration are matched by her passion for sharing them with others. And her sense of humour is infectious! I have not stopped telling people about the “things I learned from Sequoia”, and I look forward to the day I can see this incredible teacher again. The standard rooms are situated in the centre of the resort, which is opposite the salt water pool with views of the tropical gardens. The wooden beach cottages are situated less than a one minute walk from the Indian Ocean of Morjim Beach and the Chai Café. They are the biggest rooms with a specifically designed theme, based on the chakras. Each room is painted and designed reflecting this specific chakra. Devarya Wellness, located in a coastal village in North Goa, India, overlooks the Morjim Beach. This beautiful beach stretch is also known as Turtle Beach after the endangered Olive Ridley sea turtles that nest on its shores. A quiet and peaceful setting, Morjim with its lush green hills, clean beaches and the Chapora river running through it is a popular destination for foreign travellers and expats. Known for its serene atmosphere, the Morjim Beach is a great setting for a yoga holiday. It has something for everyone, whether it is a soul-searcher who is looking for tranquillity or someone looking to enjoy a relaxing beach vacation. Morjim beach is a delight for nature lovers too. Apart from the Olive Ridley turtles, a variety of flora and fauna can be spotted here. For those interested, dolphin sighting trips are offered by locals. You can even take a walk up the famous Chapora Fort for great views of the sandy beach and the green palms. Morjim beach is a perfect place for the practice of yoga or embracing a healthy lifestyle. Daily connections to the elements include long walks on the beach, swimming in the ocean, meditating on the beach as you watch the beauty of the sunset. They strive to provide and offer the best they can, which is seen in the wide range of items offered in the delicious buffet style of healthy options. Egg station – order the eggs cooked to your preferred taste, made in front of you. Seeds & Dry fruit – give a bit more flavour and nourishment with your yogurt is the option of various seeds and dry fruit. For those not vegetarian, there will be fish served 1x time per week. There is a two-week rotation of international vegetarian cuisine that includes a full course meal that is themed on the different country of origin. If accepted, the deposit becomes non-refundable and goes toward the full tuition of the course. If not accepted the deposit will be immediately refunded. The Method of Payment: International Bank Transfer, Paypal or Cash. Applicants are responsible for all bank and extra PayPal fees. If your choice is to pay through Pay Pal add an extra 4 percent to the full payments. If you do not have a PayPal account you can simply use your credit card, send an international bank transfer or pay the remaining payment with cash on arrival. To apply and reserve a space in our training send $500 US with your application. The booking amount is non-refundable. If you are not accepted your money will be fully refunded. It will be adjusted towards your total fee. Can I take this course if I have do not want to teach yoga after? If you want to bring yoga into your daily life then this course is for you. If you want learn how to safely get in and out of each pose, develop the yoga teachings are integrated into your life then this course is for you. This course is for those who want to want to make inner changes and for those interested to teach. What Style of Asana is taught on this course? The teachings are based on the Science of Hatha Yoga. We offer a blend of traditional Hatha, Vinyasa, and Yin. I attend regular yoga classes but I do not have a personal yoga practice can I still join the course? Yes you can, as this course helps those who want to deepen their own personal practice, in directly learning more about themselves and the teachings of Yoga. Will I be certified when I finish the course? If you successfully pass the course you will get a Yoga Alliance certification. We have a maximum number of 22 students in any one course to keep the training as intimate as possible. It varies depending on the location of the training. I speak limited English. Can I still join the training? The entire course is conducted in English. For some of our previous students, they learned to ask lots of questions. It is up to each individual if you are comfortable to study and learn in English. I am not so flexible. Can I still join? Yoga is not about how flexible you are in your body this is the result of practice and does vary with different body types. It’s about how flexible can you be in the mind? We welcome those who are not so flexible in their bodies. Yes, 100% attendance is required, unless you are sick. There are quizzes through out the course and each student is required to complete them. What is the average age of each student? This also depends on the location but there generally there is a big range from 20-60 years young. We highly recommend having it just in case but it is not mandatory.